There once was a time where recording professional audio required a ton of large and complex hardware. Reel to reel tape decks, advanced mastering decks, and piles of rack-mounted mastering hardware separated the hobbyist recordings from the professional ones. Multi-track recording has always been the standard, and for good reason. When you’re capturing audio from multiple sources, it takes a ton of work to mix it down to stereo without any loss of quality. Ed Wood’s classic movie “Plan-9 From Outer Space” was a bit of a technical marvel. The audio was mastered in stereo in real time, with all mastering done on the fly. The quality was clearly worse than other movies of the time, but there just wasn’t any portable way to record multi-track audio while on the go. Had this movie been made today, the results likely would have been a lot better. The hardware that used to occupy an entire room can now fit in your pocket. Digital Multi-Track Recorders allow everyone, both hobbyists and professionals alike, to record professional grade audio. These recorders are simple to use, but very advanced in design. Whether you’re recording a live concert, filming a movie, or simply recording an interview, selecting the right model is incredibly important. We’ll be taking a look at the three best multi-track recorders on the market. We’ll go hands-on and see what each model has to offer, then we’ll help you decide which one is right for your purposes. Zoom’s portable recorders are some of the most popular options on the market, commonly used by professionals when field-recording is unavoidable. The original H4N used to be considered industry standard. For some people, it still is. But the Pro model brings long overdue upgrade to the line, adding several key features that help keep this particular recorder competitive with modern options. What’s the point of having a portable recording studio that you can take anywhere, if you’re afraid to use it anywhere? The Zoom H4N Pro is rugged, designed to stand up to whatever environmental challenges you’ll face. The entire unit is wrapped with a tough rubber enclosure, keeping it protected from bumps and scrapes. On top, you’ve got the two stereo microphones which are acoustically positioned for the best coverage possible. Below, three LED lights indicate the current recording modes. Additional information can be found on the display. Despite being low resolution, it pretty clearly displays all of the relevant information about your recording including levels, runtime, and filename. The buttons in the center are fairly straightforward, offering quick access to essential functions. In the center you’ve got playback controls, with the record button featured prominently to the right. You can select your input on the left side: either the built in microphone, or one of the two XLR jacks on the bottom. Below the display, you can select which track you would like to record the sound into. Not only does it look tough, but finding the functions you need at the touch of a button are simple. From a design perspective, there isn’t much more we could ask for. There are three different recording modes you can choose from. By default, it records standard stereo audio. You can select 4CH mode to record four separate channels at the same time, or MTR to record anywhere from 1 to 4 channels on an as-needed basis. You could record three on the first run, then go back and dub a fourth track over top of it in real time. MTR is where you really start to get flexibility, which many users will appreciate. Despite the simple interface, we were surprised to see that the software is quite robust. There is a huge effects package built in, with all of the usual suspects: compression, modulation, reverb, delay, pitch, and amp modelling are all useful for musicians. There is also loop playback and a metronome, which can be useful if you’re doing a rough master with this recorder. 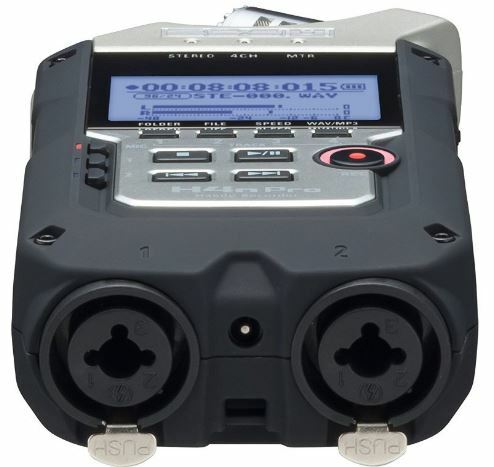 The H4N Pro is an all-inclusive package. Everything you need to record fits right in your hand. But it’s very expandable, allowing it to become a part of a bigger kit. On the bottom you’ve got two XLR/TRS inputs that can be used to hook up external microphones. This is one of the few recorders that does supply phantom power, you can use your microphones without the need for a mixing board. Digital audio out can be provided through the USB interface. It supports four inputs and two outputs, allowing you to work directly with your digital audio workstation as necessary. Alternately, you can store your audio files on an SDXC card up to 32GB in size, which fits quite a lot of audio. From a technical perspective, the H4N Pro meets all of the professional standards. Audio is recorded in uncompressed PCM with a resolution of up to 24 bits, and a sample rate of 96 Khz. This is the highest standard of lossless audio, but these files are huge. So you’re given the option of using MP3 with a bitrate between 48 and 320 KBPS. The preamps have an extremely low noise floor. It’s rated below -120 DBU. This isn’t game changing, but still acceptable for a portable unit. Realistically speaking, unless you’re using top-tier microphones, you shouldn’t expect any loss when going through the XLR ports. The built in microphones are pretty impressive, and support sound levels up to 140 Db. We’d recommend them primarily for voice or environmental sounds. For instruments, an external microphone would sound better. After the success of the H4, Zoom wanted to produce something for users who demanded a little more. With the H6, it’s possible to record an entire album with just a single device. At it’s core, the same hardware the drives the famous H4N Pro is found. But on the outside, you’ll see a few more features tacked on. The design isn’t nearly as rugged as the H4N, and for good reason. 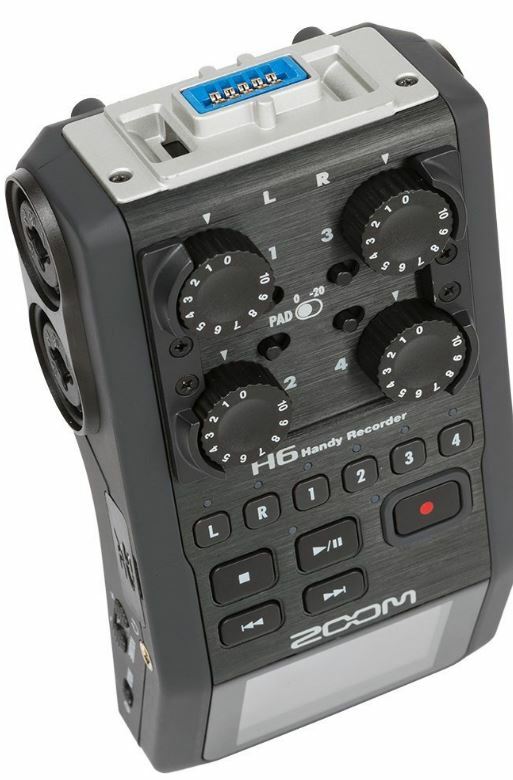 The Zoom H6 is a recorder intended for a completely different environment. It’s designed for people that want control, precision, and accuracy. This is most obvious when you see the five large dials at the top of the recorder. These are your gain controls, allowing you to master your audio on the fly. There is one for each input, and then one that adjusts the two microphones at the same time. Below the gain, the controls are fairly simple. You’ve got your input select, and playback controls. As usual, the record button is very prominent and easy to find. The LCD screen is located on the bottom this time. If you’re holding it in your hand, this is less than ideal. But if you’re mounting it somewhere, this makes a lot more sense. From the appearance alone, it’s pretty obvious that this isn’t your typical handheld recorder. Instead, this is the focal point of your mobile recording studio – offering significantly improved performance over more compact models. This is not really the type of recorder than you can just push the button and record on the fly. We’re not saying that it’s impossible – you technically can do that. But without a little configuration, you’re missing out on what it has to offer. Before recording, a menu walks you through a few different settings. Every channel has its own cutoff filter, and should be set. The compressor filter works independently, and you can route any of the inputs through it, if necessary. There are a ton of settings available, so you can start the mastering process before you record. Although it’s simple in design, this is basically a whole DAW in the palm of your hand. You can think of it like a manual transmission. Yes, it’s easier to drive an automatic. But with a manual, you have a lot more control over how the engine operates. Aside from the built in stereo microphone, there are four XLR inputs on the side of the H6. These ports can provide 12, 24, and 48V phantom power, allowing them to support virtually all microphones on the market. USB audio ports are provided, allowing you to output stereo sound or feed 6 channels of digital audio into the recorder. If you are not interested in using the capsule mike, this can be removed and replaced with two additional XLR inputs – although this is an optional accessory. Audio is stored on an SD card. A 2GB card is included, and you can use up to 128 GB. This is a small, but welcome improvement over the H4N. With 6 channel recordings, additional space is necessary. The internal pre-amps are very similar to the ones used in the H4N, as is the encoding chipset. You can record in 24-Bit WAV at 96Khz, or MP3 up to 360 Kbps. From a technical standpoint, you’re not going to see any compression loss if that’s a concern. You pay a bit more for this recorder over the cheaper model, and it really pays off. Our recordings sounded like they’d already gone through the initial mastering process. The difference from the H4N was night and day, with an exception. You have to set it up. As long as you take the time to configure and use all of the powerful effects built in, you’ll come out of your session with a pre-mastered track. If you leave all the settings stock, you won’t see any improvement over the 4 track model. 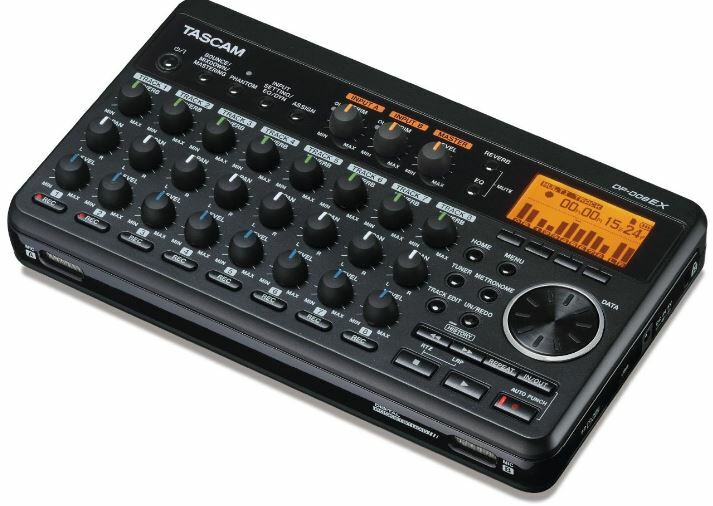 Tascam’s Portastudio line got it’s start 30 years ago, recording four tracks onto a typical cassette tape. A lot has changed between now and then, but one thing remains the same – the form factor. Although much larger than most portable multi-track recorders, the performance you get with this model goes beyond what you’ll find with your typical model. Although it’s easily moved from place to place, the Tascap DP-008EX has a tabletop design. Whether you’ve got it in your lap or one a desk, you get the same kind of controls you’d find on a full size mixing board. Unlike most mixers, you can slip this into your gig-bag and have it on hand at all times. The control layout is simple. You’ve got 8 tracks laid out in columns on the face, with three separate dials on each track to control the levels. Along the top, you’ve got your master volume controls – one for each track as well as a master. Navigation is in the bottom left, and a set of six buttons can be used in conjunction with the jog wheel to perform advanced filtering. The display is simple and shows only levels, but the controls are intuitive enough that you don’t need much of a display. Although this recorder supports 8 tracks, you’re only able to record two at a time. Doing so is simple. You’ve got your two inputs on top: A and B. You select each input, and arm the appropriate track. As you hit record, the input will be layered on top of this track. This routing system allows you to push beyond the 8 track limitation. For example, let’s say you record guitars and drums into track 1 and 2. Once you tweak the levels, you can play back these two tracks, route them to track 8, and mix them down. You’ve now combined two tracks into one. As long as you’re okay with merging them, your entire mixdown can be performed from this simple recorder. There are editing features built right in. You can copy, paste, clone, move, cut, or silence tracks as needed. This allows you to perform some basic looping functionality. You could record a single drum loop, and copy it along for the entire length of your song. There is an entire EQ system, including a compressor and reverb processor. In essence, what you’ve got is an entire studio in the palm of your hand. Each input channel has two analog inputs. You can use the XLR ports, which come complete with full phantom power. You can also use 1/4″ stereo jacks, which have a variety of input options. These jacks support line level sound, electro acoustic guitars, and of course microphones. Data is saved to an SD card, although it’s a bit of a process to access it. To speed up performance, data is stored in a proprietary format. When you’re ready to export, you’ll have to save your current file before it can be accessed by a computer. One of the things that impressed us the most was the quality of the on-board microphone. Even when compared to our Shure SM-58, the built in mic performed pretty well. There are going to be some positioning issues, since you’ll never get your face right at the exact position. That aside, it’s rare to find an on-board mic this good. For audio recorded through an external source, we had zero complaints. This is a high end audio device, and there is no hint of digital noise or distortion. Some of the effects, such as the reverb, weren’t quite as good as you’d get in a high end DAW. But currently, you’re not going to find better without a dedicated reverb processor. 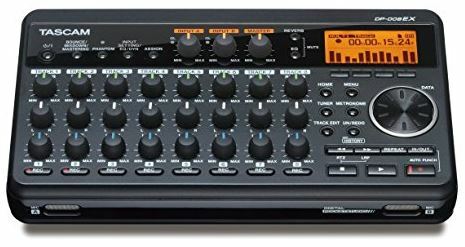 Which Portable Digital Multi-Track Recorder is Right for Me? From a technical standpoint, all of these recorders have a lot in common. But from a functionality standpoint, they’re each intended for very different purposes. 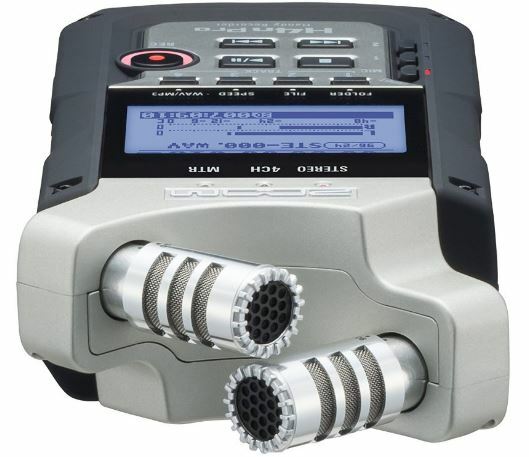 The Zoom H4N Pro is ideal for field recording. This is your secret weapon when you’re out recording a live concern, and impromptu jam session, or capturing audio for a video camera. It records the audio raw and unfiltered, and produces consistently good results without much configuration. The Zoom H6 has two possible uses. For some, adding two input channels to the H4N Pro is enough. But for others, the built in filters and mastering tools are the selling point. If you control your source, this recorder has the tools you need to tweak your recording for best performance. At the end of the spectrum, we’ve got the Tascap DP-008EX. This recorder is as close to a portable studio as you can get. You can lay down your tracks two at a time, master them, edit them, and mix them down on the fly. Bring this recorder out to your next jam session, and you can walk away with a fully mastered track – without ever touching a computer.